We believe that every patient deserves the highest quality of care, and we are dedicated to providing you with the most advanced treatment available in a welcoming, gentle, and professional setting. We have two offices in Alaska. One in Fairbanks and one in Anchorage. We alternate between the offices so that we are in each office twice a month. To get to our office from Airport Road: Turn off Airport Road towards the Hospital on Cowles. Go past the Hospital, the Medical-Dental Arts Building and The Big Dipper Ice Area. At the end of their parking lot, turn left on 21st Avenue. Drive until you get to a stop sign. At that stop sign come through the intersection and our office is located in the second building on the right hand side. 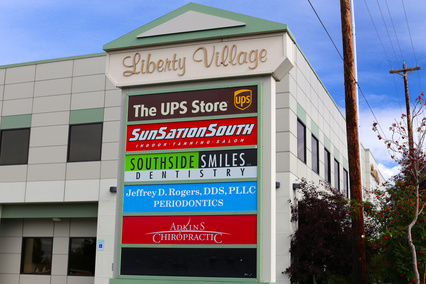 We are located across the street from Fred Meyer on Abbott Road in Liberty Village. Dr. Rogers is unique among his peers in that he spent a number of years as a professor charged with training future dentists and periodontists. He is a recognized expert in his field and has been featured at national and international meetings. He has spoken at the World Congress of Oral Implantology and the International Association of Dental Research where he helped establish guidelines for implant dentistry. This passion for learning and teaching now drives him to maintain the highest level of training so that he can provide his patients with the care they deserve. When Dr. Rogers isn't working, he enjoys photography, reading, and spending time with his family.